Enjoy remarkable experiences by day and night. Each Insight Vacations journey includes a collection of engaging and authentic signature events. In addition to the sightseeing and signature experiences you enjoy during the day, the tour also includes signature evenings in many of the locations you visit. Each signature evening brings you closer to the local culture, and heightens your travel experience. Whatever your evening may hold, you will not have to worry about a thing. Your tour director, who you can think of as your personal concierge, is on hand to take care of all the evening’s arrangements, and your Insight driver will be there to chauffeur you home so there is no need to flag down a taxi, and the trip back to your hotel will always be quick and comfortable. 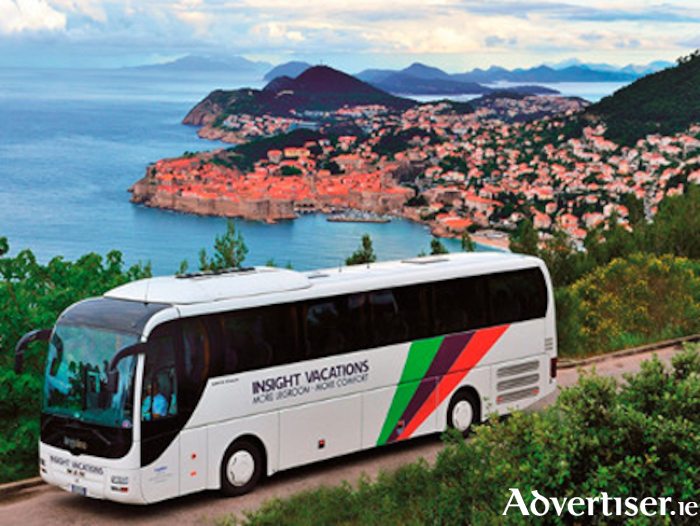 With Insight Vacations you will travel in armchair comfort, with the same spacious legroom found in airline business class. The entire fleet of luxury touring coaches has been uniquely customised, removing several rows of seats to allow up to twice as much legroom as the standard coaches used by other operators. For more information, contact Fahy Travel on 091 594747, [email protected], or visit the office at 2 Bridge Street, Galway.